QZSD Multi-Coated 52mm Close-Up Lens Filter / Macro Lens Optical Filter +8 : allputer.com - Accessories for all your Portable Electronics & Computers! Every camera has a limitation of the minimum distance for shooting the picture. That means you cannot go closer to the object more than the distance ecommended by the manufacturer. - This macro filter set consists of 3 close-up filters allowing the photographer to achieve professional results at low price Made of high quality optical magnifying glass cutting down the close-focusing distance of the lens. 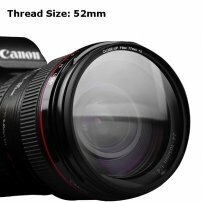 - Compatible with any filters that are 58mm in diameter (For all Sony, Canon, Nikon, Olympus, Pentax, Panasonic, Sigma, Tamron, Minolta, and other manual lens etc). - You can use the filters individually or combined (+2 plus +4 will become +6), different filter lens may not use together however, if you have any queries, please assume it is to be used individually.